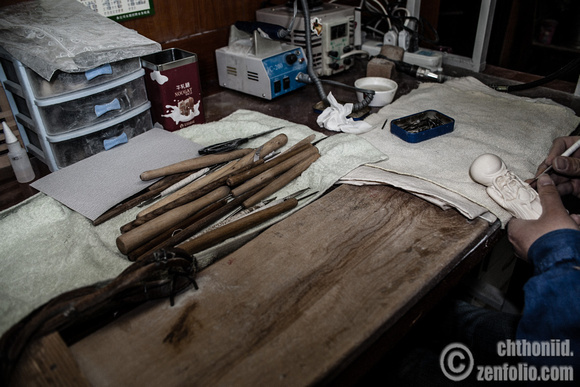 As part of the ongoing investigations of the ivory markets in China we have been visiting carving factories. We’re slowly getting through them. Of late we have also been interviewing every carver about their output, experience and when they started their employment. To date, that is about forty carvers we’ve interviewed. 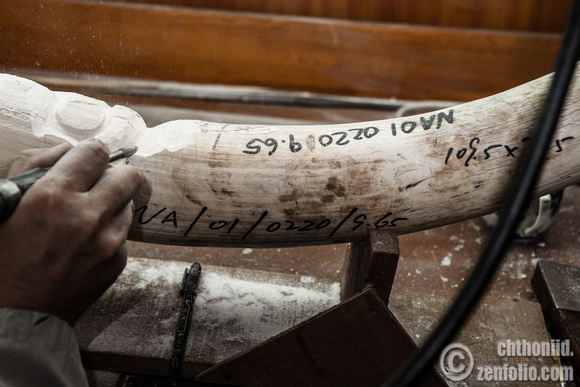 This gathers valuable information about the throughput of ivory in factories and how experience and the type of carvings affects this. This tests the feasibility of turning the large volume of illegal ivory exported out of Africa since 2009 into carvings. This series of photos all came from Beijing ICF. 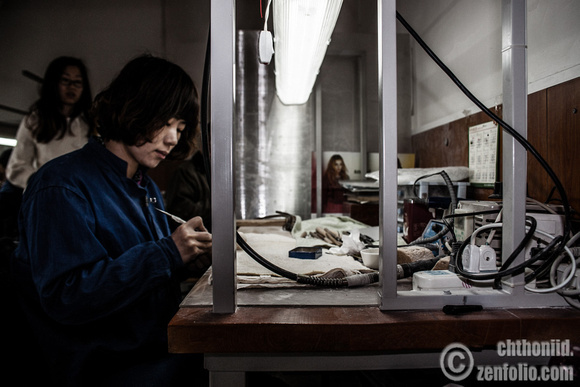 Just before the 1990 CITES ban, this factory employed 800 people, of which 650 were carvers. 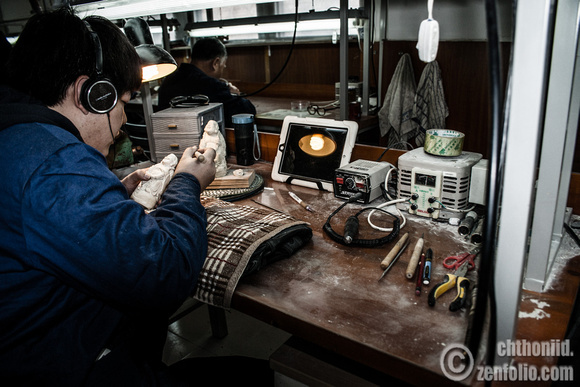 Prior to the 2008 CITES decision to allow a one-off sale of ivory to China (and Japan) the factory was down to 8 carvers. This factory so far is unusual because the carvers do nearly all the work. In other factories the carvers just carve the pieces, while specialised polishers finish the piece by, well, polishing it. As is typical of many legal factories the output is with larger pieces. 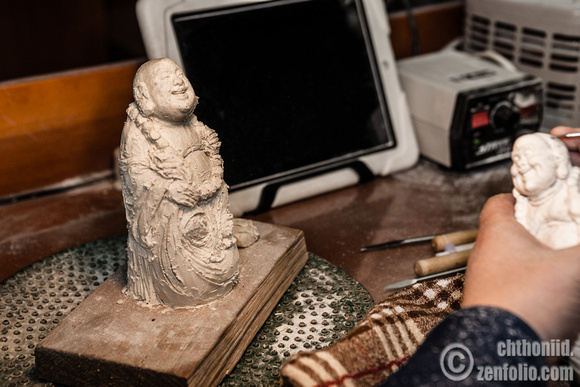 Most carvers do not produce small generic items like chopsticks or necklaces. New carvers were added in 2009 and none since. 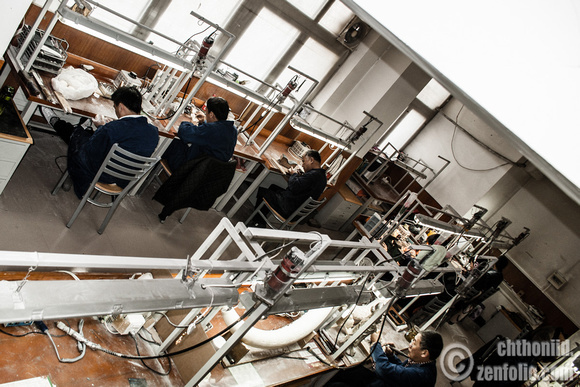 As the pictures show, a factory is not a large establishment. Production while aided with power tools now, is still artisanal. Pieces will often take months to complete. 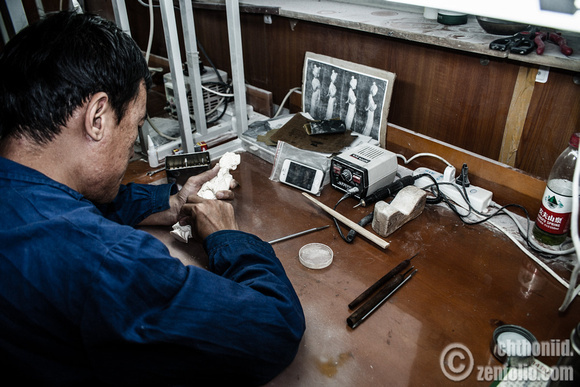 Even though it is not a large enterprise, this company is one of the largest ivory factories in China. The company contributed financially to the 2008 purchase of ivory from four Southern African countries. It is one of the core-firms in this market. 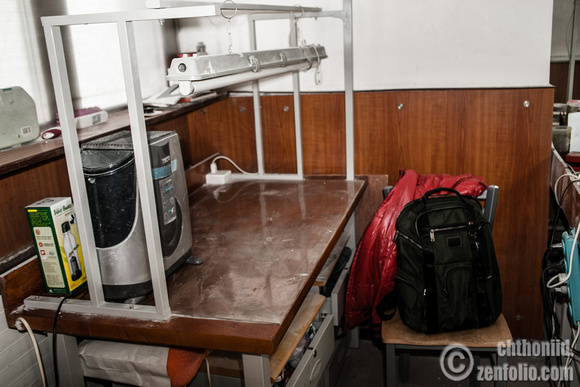 #1 Interior – this scene is taken from some stairs, and captures all but two of the workstations. 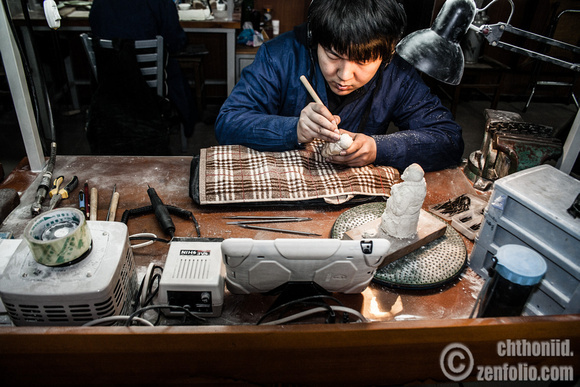 The number of workstations provides a check to the number of carvers employed. #2 Senior Carver- large tusks are the exclusive preserve of very experienced carvers. 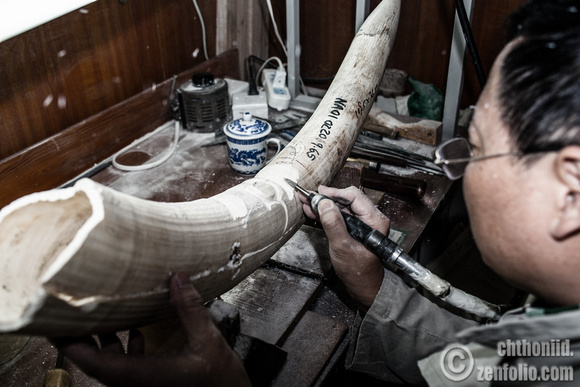 If you make a mistake carving ivory, you cannot rub it out and start all over. The ink-code on the tusk indicates it is from Namibia and 9.65kg. #3 Carver – carvers often specialise and stick to a narrow range of subjects. 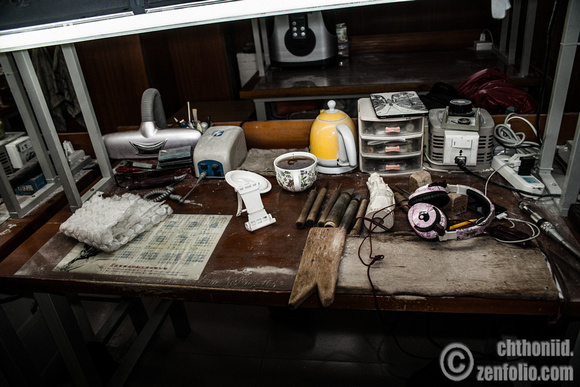 #4 Desk- this gives a view of the equipment used. 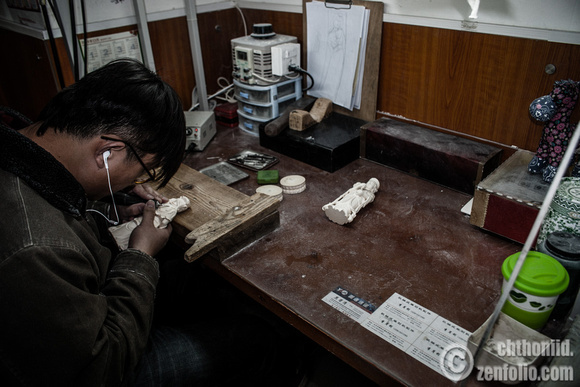 #5 This carver has made a clay figure first before starting on his piece. #9 It can get dusty. 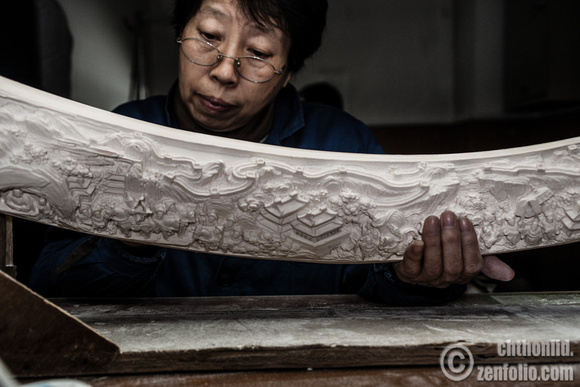 Ivory loses a lot of the raw weight when it is carved. #12 Faces are reputedly difficult to get exactly right. Some carvers will specialise in one gender and can baulk at attempting the opposite. #13 Another senior carver. There were four of these in the factory. Most had started their careers in the 1970s. 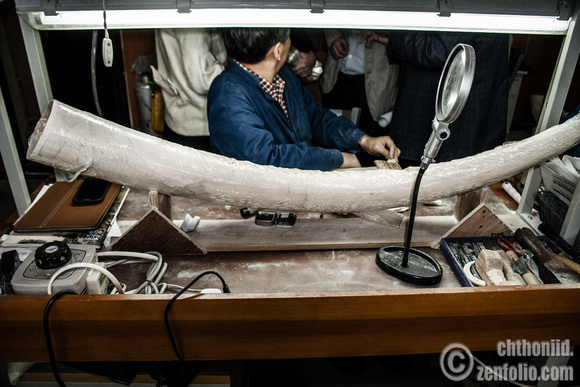 #14 The detail work applied to large tusks can take a long time to complete. Some tusks take a year or more to finish. #15 One of the carvers was on maternity leave. We remembered her from our 2013 visit. This is why work-stations are a reliable way to check employment claims. #16 Close up of the Namibian tusk. There is much left to be done. I think this gives a good idea of the size and scale of the factories involved here.